Nottingham Forest confirmed their place in the Championship play-offs with a stress-free victory over 10-man Crystal Palace at Selhurst Park. Forest, needing a point to secure their spot, went ahead when Lewis McGugan's rasping shot bounced in from 18 yards. Dean Moxey was then sent off for a late lunge on Marcus Tudgay, who made it 2-0 with a header after the break. And substitute David McGoldrick's stunning 25-yard shot sealed the win and a play-off date with Swansea City. The Reds were already on top by the time former Derby County defender Moxey was shown a straight red card for his reckless, studs-up challenge on Tudgay after 25 minutes. But even if Forest had failed to get the precious point they required, it would have taken an emphatic Leeds win over champions QPR at Loftus Road, and a six-goal swing, to nudge Billy Davies' side out of the top six. Leeds did emerge victorious with a spirited 2-1 success but Forest fears that Rangers might adopt full party mood and a lackadaisical approach after escaping a points deduction over the Alejandro Faurlin saga proved unfounded. The Reds looked like a side desperate to avoid having to rely on other sides anyway. And despite a promising Eagles opening in which Nathaniel Clyde skipped down the wing and sent over a fine cross, Forest soon began to dominate. Luke Chambers almost headed them ahead but Pablo Counago diverted the centre-half's effort up on to the bar and away to safety and then McGugan sent a rasping low drive narrowly wide of the far post from the edge of the box. McGugan then settled Forest nerves when he drove his shot down into the turf and into the back of the net with deadly accuracy. Palace hopes all but vanished with Moxey's dismissal which forced boss Dougie Freedman to sacrifice striker Counago in favour of another ex-Ram Claude Davis. The hosts did regroup after the break and Davis and Patrick McCarthy both threatened from set-pieces while Neil Danns shot just wide after a fine run. But Forest, who have now won four in row as they head into a two-legged semi-final play-off date with Swansea, always looked comfortable. Tudgay's close-range header from Brendan Moloney's pinpoint right-wing cross settled any remaining nerves with 20 minutes left. And McGoldrick scored the goal of the game when he turned unopposed to smash the ball home from distance on 80 minutes. McGugan almost added his second with a vicious free-kick that went over but the travelling 3,500 Forest fans did not need another goal to start their celebrations. "I am disappointed with the result, but for us to finish where we have from where we were when I took over is a huge success. "I will have discussions next week about budgets but my early signs are we will be going the way of bringing young players through. "I will try and stabilise the club over the next few years and build it slowly. I don't see us buying £1m players, we are not geared up for that yet." "I am very proud of getting to the play-offs again. This group of players have been written off time and time again. "But we know what the play-offs is about - it is a lottery, Lady Luck and refereeing decisions. "If you get the breaks you can get there - and the good thing is that you are looking at a very confident Forest. "It is a Forest that is scoring goals and one that is looking forward to the difficult challenge over the next two matches. Hopefully we will get those breaks." 90:00+4:13 The referee signals the end of the game. 90:00+3:49 Inswinging corner taken right-footed by Neil Danns played to the near post, Lewis McGugan manages to make a clearance. 90:00+3:00 Paul McKenna challenges Kemy Agustien unfairly and gives away a free kick. Kemy Agustien restarts play with the free kick. 90:00+1:49 Effort from the edge of the area by Paul McKenna goes wide of the right-hand post. 90:00+0:08 Darren Ambrose shoots direct from the free kick, Karl Darlow makes a save. 90:00+0:08 Booking Chris Gunter is booked. 89:44 Unfair challenge on Wilfried Zaha by Chris Gunter results in a free kick. 87:21 Inswinging corner taken right-footed by Neil Danns from the right by-line. 82:39 Chris Cohen gives away a free kick for an unfair challenge on Wilfried Zaha. Direct free kick taken by Nathaniel Clyne. 79:41 GOAL - David McGoldrick:Crystal Palace 0 - 3 Nott'm Forest David McGoldrick gets on the score sheet with a goal from long distance to the top right corner of the goal. Crystal Palace 0-3 Nottm Forest. 78:22 Chris Cohen takes the inswinging corner, clearance made by Claude Davis. 77:47 David McGoldrick fouled by Wilfried Zaha, the ref awards a free kick. Free kick taken by Luke Chambers. 76:28 Lewis McGugan challenges Sean Scannell unfairly and gives away a free kick. Kemy Agustien takes the direct free kick. 75:46 Wilfried Zaha concedes a free kick for a foul on Paul McKenna. Direct free kick taken by Luke Chambers. 73:16 Free kick taken by Lewis McGugan. 73:16 Substitution Karl Darlow replaces Lee Camp. 73:16 Kemy Agustien concedes a free kick for a foul on Paul Anderson. 71:48 Wilfried Zaha fouled by David McGoldrick, the ref awards a free kick. Julian Speroni restarts play with the free kick. 70:21 Substitution Wilfried Zaha joins the action as a substitute, replacing David Wright. 69:26 The assist for the goal came from Brendan Moloney. 69:26 GOAL - Marcus Tudgay:Crystal Palace 0 - 2 Nott'm Forest Marcus Tudgay finds the back of the net with a headed goal from inside the area. Crystal Palace 0-2 Nottm Forest. 67:54 Substitution David McGoldrick joins the action as a substitute, replacing Kris Boyd. 67:33 Outswinging corner taken right-footed by Lewis McGugan. 66:56 Inswinging corner taken by Chris Cohen, Kemy Agustien makes a clearance. 63:06 Neil Danns fouled by Paul Anderson, the ref awards a free kick. Direct free kick taken by Darren Ambrose. 62:45 Chris Gunter gives away a free kick for an unfair challenge on Neil Danns. Darren Ambrose crosses the ball from the free kick right-footed from right by-line, clearance by Wes Morgan. 61:51 Free kick awarded for an unfair challenge on Kemy Agustien by Lewis McGugan. Direct free kick taken by Julian Speroni. 60:46 Substitution Sean Scannell is brought on as a substitute for Jermaine Easter. 60:46 Substitution Paul McKenna joins the action as a substitute, replacing Guy Moussi. 59:39 Effort from the edge of the area by Neil Danns goes wide of the right-hand post. 57:49 The referee penalises Kris Boyd for handball. Free kick taken by Julian Speroni. 54:12 Corner taken by Darren Ambrose from the right by-line. 53:22 Chris Gunter gives away a free kick for an unfair challenge on Neil Danns. The free kick is swung in right-footed by Darren Ambrose, Guy Moussi manages to make a clearance. 52:44 The referee blows for offside. Indirect free kick taken by Julian Speroni. 49:59 Guy Moussi challenges Jermaine Easter unfairly and gives away a free kick. Darren Ambrose crosses the ball from the free kick right-footed from right wing, Lee Camp makes a save. 47:17 Free kick awarded for an unfair challenge on Darren Ambrose by Chris Cohen. Darren Ambrose takes the direct free kick. 45:00+2:45 The referee blows for half time. 45:00+1:25 Lewis McGugan takes a shot. 43:32 Free kick awarded for an unfair challenge on Neil Danns by Chris Cohen. Free kick crossed right-footed by David Wright, save by Lee Camp. 38:58 Corner taken right-footed by Darren Ambrose from the left by-line to the near post, clearance by Lewis McGugan. 36:44 The referee blows for offside. Lee Camp takes the direct free kick. 28:57 Wes Morgan challenges Jermaine Easter unfairly and gives away a free kick. Strike comes in from Darren Ambrose from the free kick. 26:48 Substitution Pablo Counago leaves the field to be replaced by Claude Davis. 24:46 Chris Cohen delivers the ball from the free kick right-footed from right channel. 24:46 Sent off Dean Moxey shown a red card. 24:28 Marcus Tudgay fouled by Dean Moxey, the ref awards a free kick. 23:04 Corner taken by Chris Cohen. 22:26 Chris Cohen takes a outswinging corner from the right by-line to the near post, clearance by David Wright. 19:06 Free kick awarded for a foul by Jermaine Easter on Chris Cohen. Chris Cohen takes the direct free kick. 17:57 Chris Cohen is ruled offside. Julian Speroni takes the indirect free kick. 16:16 GOAL - Lewis McGugan:Crystal Palace 0 - 1 Nott'm Forest Lewis McGugan finds the back of the net with a goal from just outside the area to the bottom right corner of the goal. 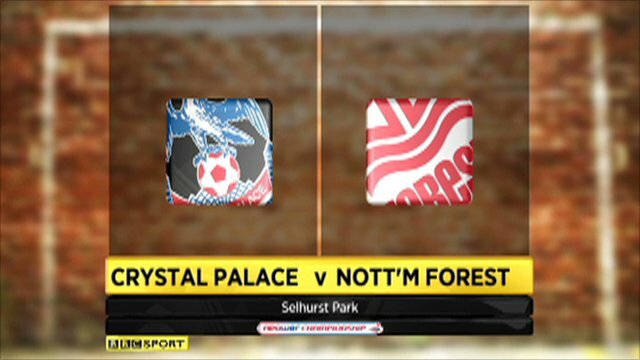 Crystal Palace 0-1 Nottm Forest. 14:00 Shot by Paul Anderson from 18 yards. Save made by Julian Speroni. 13:22 Darren Ambrose takes a outswinging corner. 9:41 Shot by Lewis McGugan from deep inside the penalty area misses to the right of the goal. 8:58 Corner taken right-footed by Lewis McGugan from the left by-line, Luke Chambers takes a shot. 7:54 Jermaine Easter concedes a free kick for a foul on Wes Morgan. Wes Morgan restarts play with the free kick. 5:44 Corner taken right-footed by Darren Ambrose, Kris Boyd makes a clearance. 5:05 Dean Moxey fouled by Kris Boyd, the ref awards a free kick. Darren Ambrose takes the free kick. 2:33 Corner from the right by-line taken by Darren Ambrose, Headed effort on goal by Patrick McCarthy from inside the penalty box misses to the right of the target. 1:49 Pablo Counago fouled by Wes Morgan, the ref awards a free kick. The free kick is swung in right-footed by Darren Ambrose, clearance by Chris Cohen.